This has been a frustrating earnings season for investors. It’s not that the companies are doing poorly. They are actually topping estimates more than usual. It’s that investors aren’t rewarding them for beating estimates. Marco directed this question toward my Earnings Drift Alert service. My response was simply that our system does account for this very instance thanks to how it is designed. But, in a broader sense, this anomaly, which hasn’t occurred since 2011, is a sign that a correction is looming. During the second quarter this year, the underlying operations for companies were doing well. According to FactSet, 73% of the companies that have reported so far have reported earnings per share above analyst estimates. This is above the five-year average of 68%. The earnings growth rate for the S&P 500 jumped to 10.2% from 6.4% at the end of June. This chart shows the return from two days before earnings to two days after for every company that beat analyst earnings estimates. As you can see, the latest quarter will be the first time since the second quarter in 2011 that returns declined for these companies. It also happened to be the last time the S&P 500 fell 20%. It declined from its peak earlier in 2011 through October of that year. The stock market peaked this year on August 7, but it only declined a modest 2.2% before climbing again. 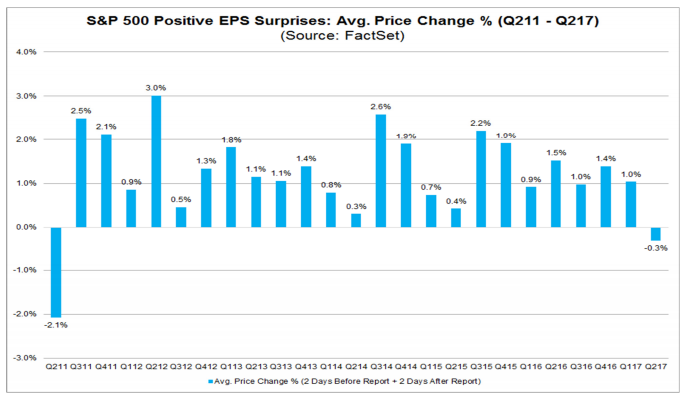 So the question is, does the lack of performance during earnings season indicate a significant pullback is ahead? It is an ominous sign if you think about the mechanics of it. These companies are topping analyst estimates. Guidance has been mostly positive. And overall, earnings growth rates have jumped. Yet investors are choosing to take profits instead of buying into the rally. Whenever investors sell on good news, it’s a bad sign. And it is just in time for the market, which has gone nearly two years since its last correction. By definition, a correction would be a pullback of at least 5%, and could dip as much as 20% like it did in 2011. Based on closing prices, we haven’t seen a 5% pullback since the end of 2015. It’s odd to go an entire year without one … and we have been almost two years without one. Needless to say, a correction is imminent. And this sign from second-quarter earnings may be the start of a much-needed correction. Because not all corrections are bad news. It’s a healthy sign for a bull market, showing investors taking profits and new buyers coming in. The absence of a 5% correction is worse than having one.